The inspiration came when Aaron was skipping stones and pining for a surf. There was something about the ripples pushed out by the pieces of rock. After years in the test lab and tweaking designs in the mud, the affable engineer came up with the giant donut (plunger, bobber, thingy, piston… whatever you want to call it). 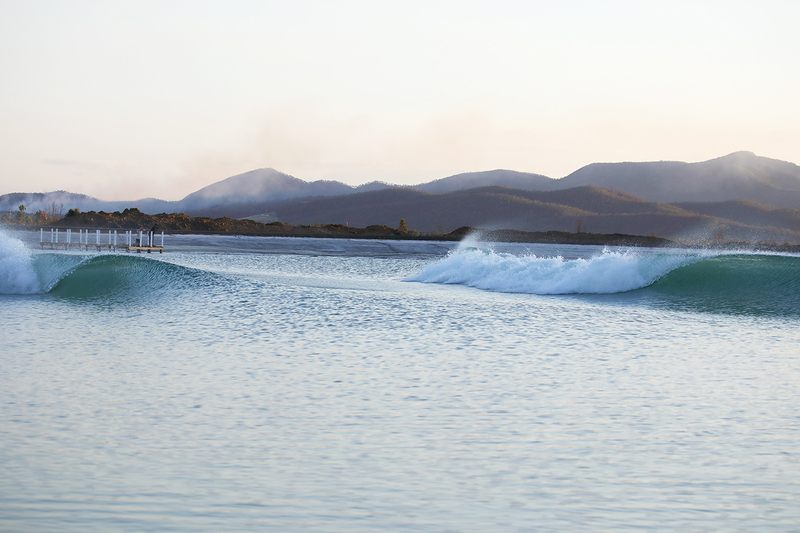 “2018 has been a pivotal year for Surf Lakes with the completion of our full-scale prototype in QLD, and first surfable waves,” says CEO Aaron Trevis. To meet upcoming demands the company appointed key team members. Paul Hardy fills the role as Chair, while Malcolm Borgeaud will take the company’s CFO position. In addition, with the signing of the first agreements on upcoming pools, Surf Lakes appoints Joel Borgeaud as their attorney. For 2019 the company says they will begin phase two testing with full-size waves of up to eight feet on the face. The waves will be pumped out in multiple wave sets. The tests hope to see 40 surf-able waves per minute across the test lake. The first commercial 5 Waves facility will break ground early 2019 and open soon after. More details on each project will be released over the next few months.